This past Saturday night, I ventured to a San Francisco instance of the Lost Horizon Night Market. It was awesome, though I sadly arrived too late to both observe and really participate. It's difficult to describe Night Market; perhaps imagine a distributed circus, where each act lives in a separate box truck, and the entertainment invites audience participation. I shot the photo above while crammed into the back of a music themed truck, where the NYC-based band Huff This! 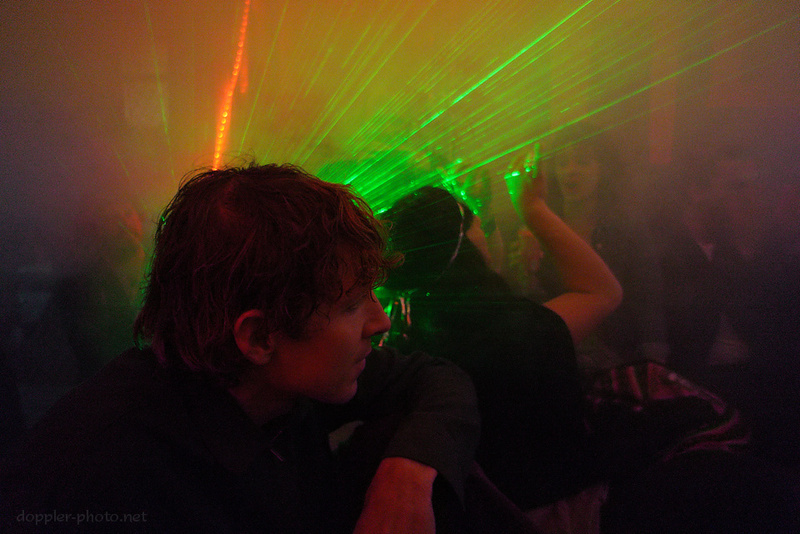 was rocking through a dense cloud of fog-machine-induced haze. The green lasers originated from a handheld laser doohickey that the man on the left was holding. As an unrelated technical aside, the NEX-7 does well in the dark, but only if you shoot RAW. Even on the "low" setting (there is no "off"), the high-ISO noise reduction obliterates all semblance of high-frequency detail, leaving behind a splotchy mess. I've generally been shooting RAW+JPEG, and I'll likely continue for this reason.